Here is the second half of my Sportlots order that I picked up at my P.O. Box last week. I love the top card with the Hall of Famers on it. These Classics inserts are great to add new cards of old stars. I've always liked shared cards, so the Elite Team card is nice to have to join the Classics card. 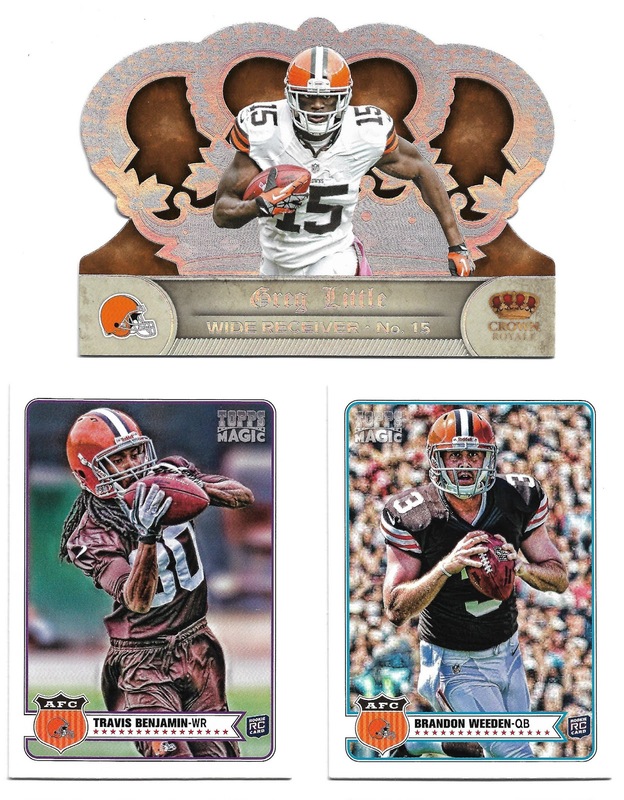 I managed to knock off all three Browns from the Sunday's Best base insert set, but there are still a whole bunch of parallels to look for. 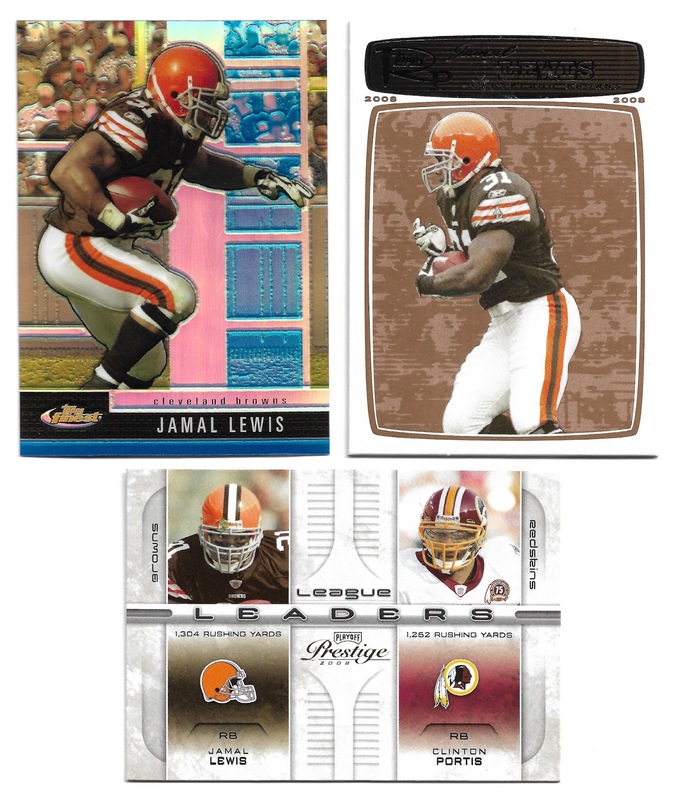 Some Jamal Lewis cards. Out of the parallels, I prefer the Blue Refractor card over the Bronze one. Probably because refractors are shinier. Another shared card, this time showing Lewis as one of the NFL rushing leaders. Lewis was the third leading AFC rusher, while Portis was the third leading NFC rusher. A whole bunch more parallels that I needed. 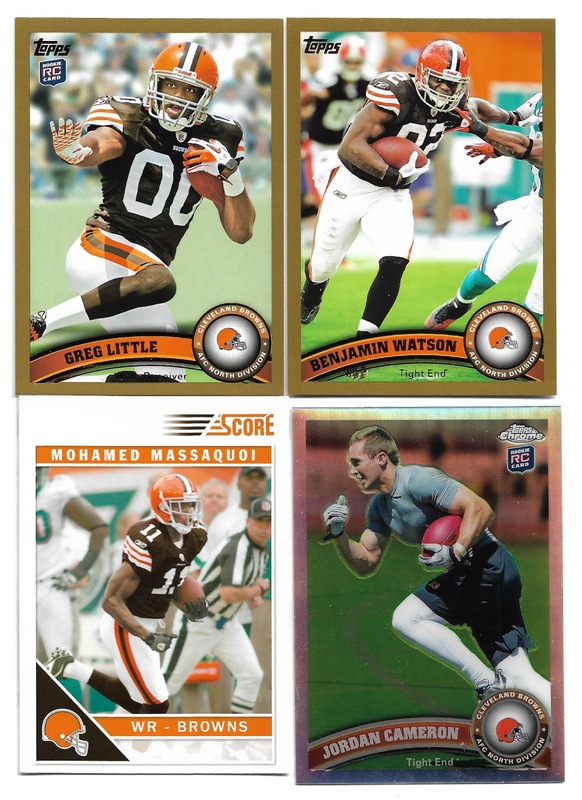 I like the thicker Bowman Gold parallels, but the Score Glossy parallels have sometimes been the bane of my collecting. I'm sure that I've gone through my collection a few times, trying to figure out if I have the base or glossy versions of each card. I always have to shine a light on the card and rotate it a bit to see if I see a glossy sheen. I want both, and think that I've discovered two glossies in my collection, or two base cards in my collection many times after I've already sorted them. I think that they are sorted out now, and I verified that I needed this glossy when I added it to my collection. 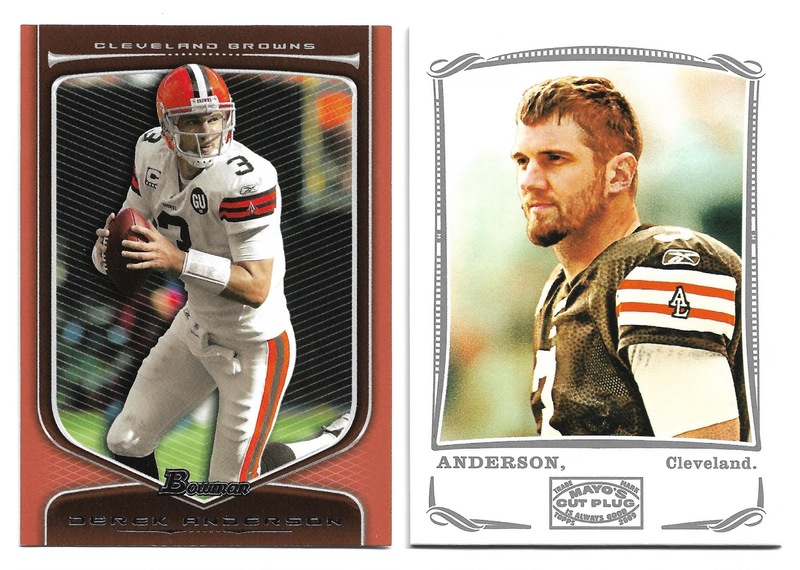 With a lot of the retail parallels in sets, I'm sometimes confused as to whether I'm actually finding the right card. I had already owned the hobby versions of these cards, and needed to add the retail versions. The simple difference between the two is that the word Authentic can be found under the SP logo on the hobby card. Signed after Josh Allen's injury, Derek Anderson started two games with Buffalo this year, suffering a concussion against New England in the second one. It looks like Anderson may be back from his concussion for this week, and that he will get the start. Allen seems to be expected back after Buffalo's Week 11 bye, so there is a chance that this might be Derek Anderson's last NFL start. 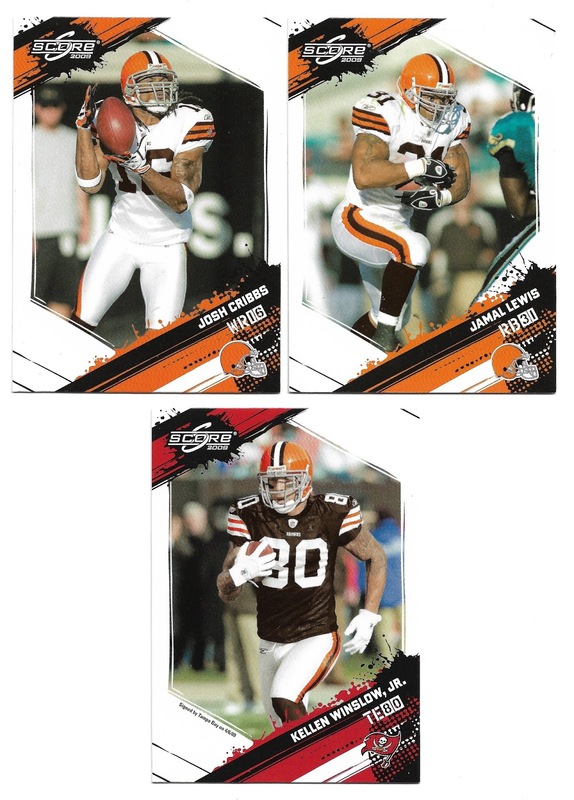 Although the shared card is cool, I think my favorite of these three cards is the Team Colors insert. People laugh that I like the brown and orange colors, but I do. I prefer the old uniforms to what the Browns are wearing now, and I know that the team changed the orange a bit when they came up with the new uniforms, but I would never want them to change their colors away from brown and orange. Remember what I said earlier about the base and glossy Score cards? 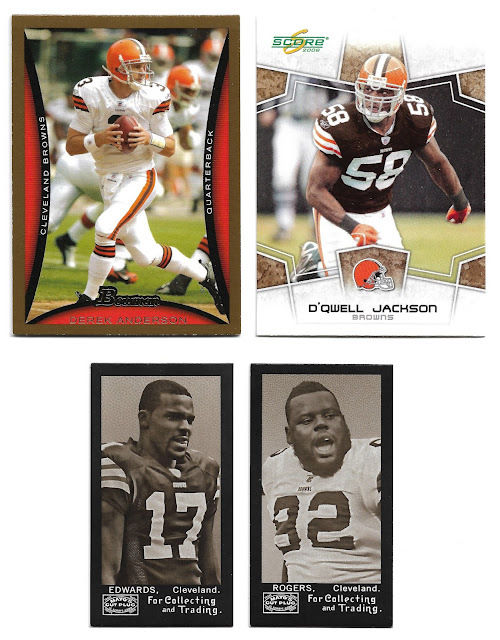 Here are two more glossy cards that I needed, and as it turned out, I had the glossy Winslow card, and needed the base one. Now we're getting into another thing that I dislike. 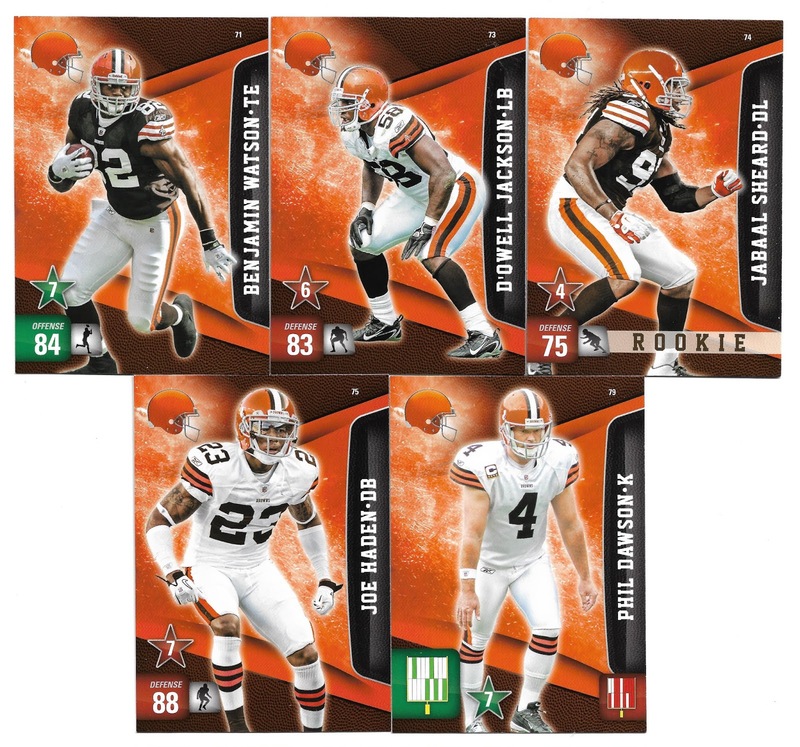 Why would you have a set called Rookies & Stars with parallels called Longevity, and then put out a Panini Rookies & Stars Longevity set? Do you know how confused I can get when I'm trying to find cards I need for these sets? Just to make sure that I get the right cards? And I have to hope that the seller knows the difference. Ah, well, two more cards off the wantlist to help solve that problem. It is nice to get these two Colt McCoy Draft Class inserts. McCoy is still in the NFL, as the backup quarterback with the Redskins. The other two players he is featured with, Jimmy Clausen and Jordan Shipley, are out of the NFL. 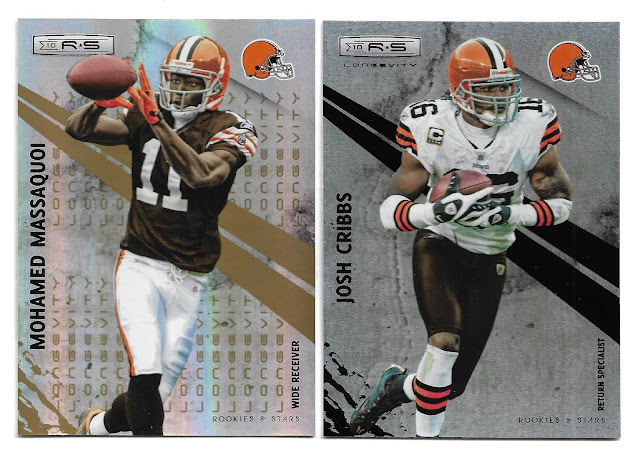 The Cribbs gold card brings me up to ten out of the fourteen gold cards for the team set. I'm slowly getting it all. And I do like these nice gold-bordered cards. These cards complete the base team set for me. I am very happy to pick up a new Phil Dawson card, and the Jabaal Sheard rookie card. I still need two autographed cards, and one parallel card from the set. 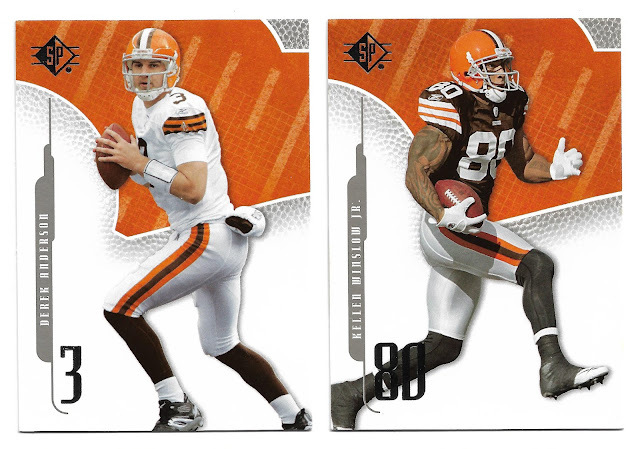 These two 2011 gold cards bring me up to five out of thirteen for the team set. It is lagging quite a bit behind the 2010 team set. Finally, some more parallels to finish my order with. I've always liked the die cut crown cards so it's always nice to add another one to my collection. I like mini parallels, but not the fact that there are four different ones to find for this set. 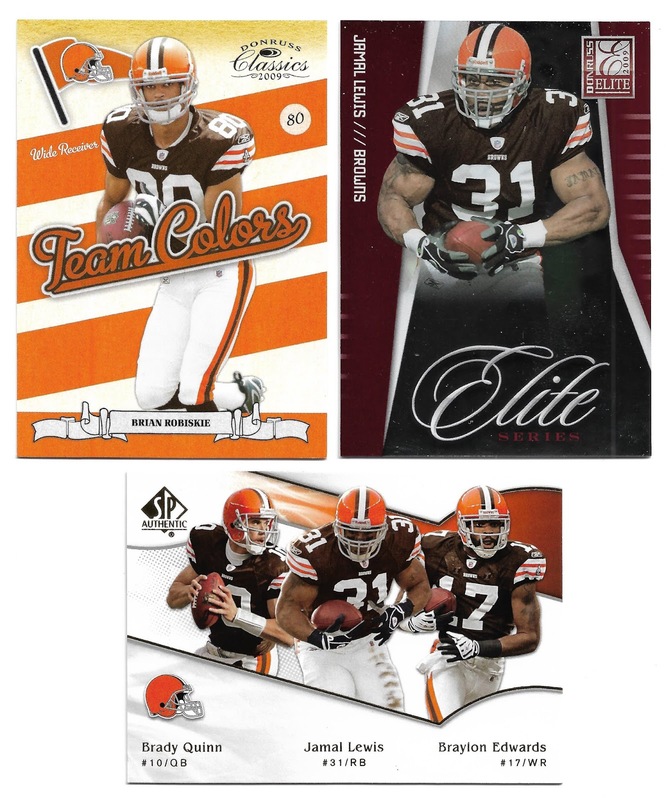 I guess the card companies need to make sure that I will always have Browns cards to look for. So ends another Sportlots order - the first in a long while. Of course, this whet the appetite, and I wound up making another order. I'll be sure to post about it after I get it. I forgot to add something. I participated in the two blogger Secret Santas that Matt had previously organised. Since he is on a break from blogging, Jon at A Penny Sleeve For Your Thoughts has taken over this year. It has been a lot of fun in the past, as I'm sure it will be again this year, and I'm looking forward to participating in it again. I love the Classic Triples card that you led off with, so much so, that I think I'm going to have to get one of those for myself. I think this is the first time that I've seen the 2009 Score too, not a bad looking design. Thanks for helping promote the Secret Santa! Love the look of 2012 Topps Magic... and of course the brown and orange of the Cleveland Browns.